Nov. 9, 2017 2:10 p.m.
A Nanaimo woman was caught by surprise this morning after a deer tripped and fell while leaping over her backyard fence. 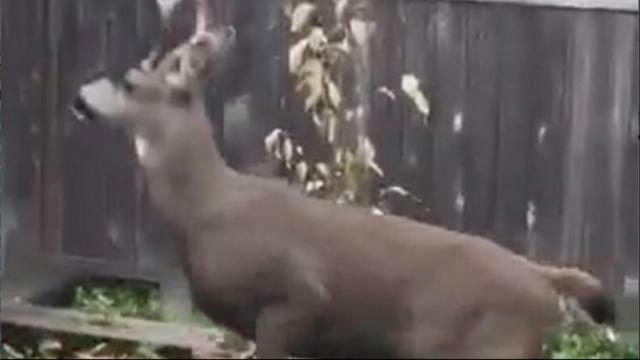 Natasha Mickey, who lives in the Hammond Bay-Rutherford neighbourhood, posted a video on Facebook of the deer’s leap from her backyard on Thursday, Nov. 9. After circling, the deer jumped over a fence she estimates at close to two metres, but its hind legs hit the side of the fence and the deer somersaulted over to the other side. Mickey said she heard noise in the backyard, went to see what was causing the commotion and started recording video on her phone. “It had nowhere to run because I was standing there, and its automatic instinct was to run and jump over the fence and it kind of missed pretty hard. It did a couple of somersaults,” said Mickey. Mickey went to check on the deer, but it was gone. She suspects the deer entered the yard through an open area in the back and thinks it was trying to eat vegetables in the garden. While deer are seen on the streets and at nearby schools, this is the first time Mickey has seen one in her backyard. She said next time, she won’t come so close.